We’ve always encouraged you to keep on planting into the Fall, and we’re sure that you don’t want your current crop to be the last of your homegrown veggies for the year. In honor of your continuing veggie crops, we will be offering you a few tips each week to keep you green and growing! We receive many of the same questions and troubleshooting problems year after year, so here is our insight on some common Fall veggie growing questions. about those pesky brown spots on their heat-stressed basil. If we could take an educated guess based on that description and this nasty humidity we’ve been having, we’d tell you that it’s probably Downy Mildew. DM is a wind-borne disease that can devastate a whole crop of basil. If you see this type of spotting, pull out the plant from the root and throw it away in a trash bag-do not compost it! 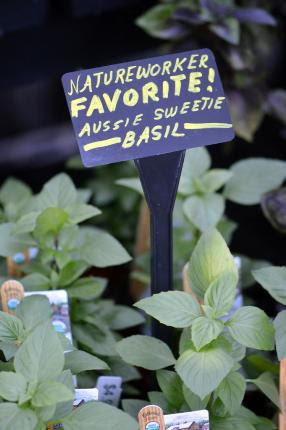 We have a variety called Aussie Sweetie that holds up well in the heat and doesn’t flower. It’s a great replacement option, although you should pick a new planting spot for your new Basil plant. Water in Organic Plant Magic when you first put in your basil to boost the immune system at an early stage, this will help ward off any future problems. 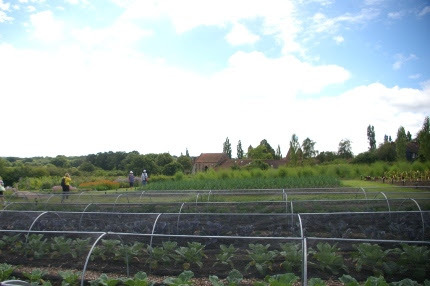 In England, all the large veg gardens I visited covered their Brassicas with mesh netting, their version of floating row covers. Yes, even Batman has trouble fighting off the bad guys who eat his broccoli, cabbage, brussel sprouts, kale and any other brassica he wants to grow. This is a case where the best defense is a good offense. Start your season off strong with floating row covers. Otherwise, you will be outside spraying and throwing your arms up in defeat. Row covers save you the time and heartache. They provide a protective barrier from the white cabbage moths who lay their eggs on your plants. At Natureworks we use floating row covers made of a thin, white fabric. Rain and sun can get through. Here we have covered a zucchini squash plant in the spring to keep the squash vine borer from laying its eggs. 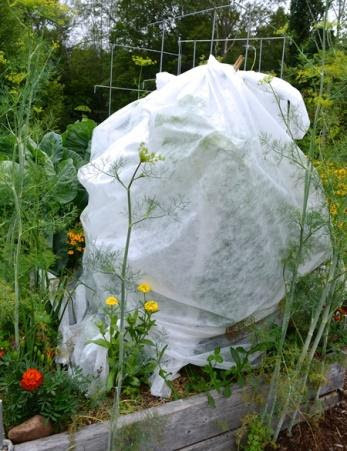 Not only is this the best way to ward off their eggs from turning to voracious caterpillars who eat all your plants, it also allows rain and light to get through to your beloved brassicas. Remove the covers when your plants start getting big and strong, water in some organic plant magic and keep a close eye. If caterpillars still manage to come around, your plants will have more gusto to fight them off, spray Bt as a last resort. Keep row covers around for late in the season to extend the growing time for your lettuces and other Fall crops, as well. Save them for protection in early spring when we have the occasional cold snap, and put them over the first plants of your summer squash to keep squash bugs at bay. You can wash row covers and use them again year after year. Ask any seasoned farmer about essential fall growing supplies and they will always say floating row covers.